Robotic Automation has helped an Australian tissue manufacturer to automate its ‘end-of-line processes’ and at the same time save space, costs and labour. Not only did it help improve on its product quality and reliability but also resulted in increased production. Prior to automation, the manufacturer faced a major problem. At the end of the production line, there were bundled multipacks that were mounting up at the speed of forty per minute. The rapidness of the production demanded more than two staff in order to pick and pattern-stack these bundles onto their respective pallets. These bundles would rise up to a height of 2.9 metres. Having a project with three such lines, the company needed more than six staff per shift. This was when it decided to automate its palletising operation. This kind of repetitive, intense and constant labour would result in strain injuries, increase in costs, extra break-times as well as losses due to the time mislaid towards production and staff management. Further, automating would require six robots in total as there need to be two robots in every line. The necessity of a larger investment as well as the limitation of available floor-space started to become an apprehension. The solution to this problem came in the form of MOTOMAN EPL160 robots that have 4-axis Servo Twin-gripper effectors. 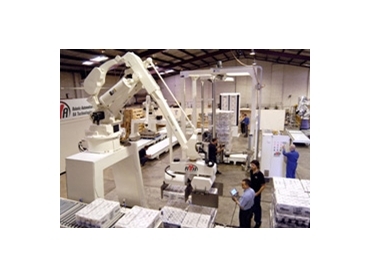 Robotic Automation’s engineering team visualised the possibility of an articulated twin-gripper that would pick, orientate independently as well as nest 2 loads as soon as the robot transferred them from the line to the pallet. This exercise would efficiently double the capability of each robot and reduces it to half the floor-space and robots needed. Designs were made, prototyped and computer modeled. Several mechanism and gear-box designs were explored and a compatible design that offered the crucial weight-to-torque output was incorporated to meet the project requirements. The 160kg mid-range MOTOMAN robot's capacity of payload was adequate to cover the weight as well as the inertia of the twin-gripper and the bundled loads of product. It also offered the best reach to transfer onto a pallet stack of 2.9 metres height. The final testing and installation revealed that the system was able to orientate, pick, transfer as well as place a multipack bundle every 1.5 seconds. Further robots are now in the process of being commissioned in the company’s expanding operations.